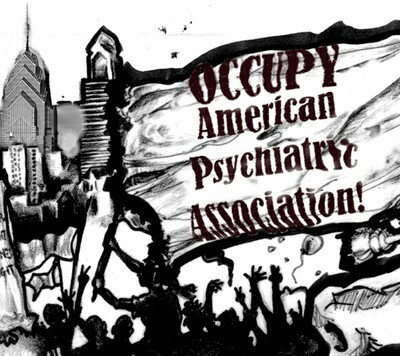 In my previous post I talked about the Occupy the APA (American Psychiatric Association) 2013 protest that took place yesterday (Sunday 19th May) in San Francisco,California. Live Streaming of Occupy the APA 2013 can be viewed on http://bit.ly/10kf0cS or on http://new.livestream.com/accounts/3973214/events/2094372. A psychiatric survivor activist who is also a lawyer,Ted Chabasinski, talked very movingly about his encounters with children and young people in the care system who have also entered the psychiatric system in the USA; Ted is in a way seeing himself in those children and is able to connect with their profound emotional distress given that he too experienced extreme abuse from the mental health system as a young person – as a 6-year old boy he was experimented on with electroshock and he was locked up in a state psychiatric hospital until he was 17; Ted stressed the lack of humanity and the inability to meaningfully relate to these children’s distress that he feels characterise the majority of psychiatrists; Ted went as far as depicting the majority of psychiatrists as ‘sociopathic personalities’. Another psychiatric survivor, who is also a family doctor, really passionately portrayed psychiatry as ‘immoral’ given that psychiatrists tend to over-medicate people, often with unsuitable drugs. And then spoke Leonard Roy Frank, a long-time activist and survivor of electroshock and insulin coma therapy; Leonard is in his 80s and has a very powerful presence; he reminded me of those ascetic, deeply spiritual and emaciated figures that one is likely to meet in Greek and Russian Orthodox monasteries; Leonard, among others, talked about how psychiatrists prescribe drugs that kill; he mentioned the time (1996) when the drug Zyprexa (Olanzapine) came out- Zyprexa being one the most destructive atypical anti-psychotics; apparently during the 3-year trial that was carried out in order for Zyprexa to be approved for release to the market, a number of people – 1 in 125- died; this Leonard considers a crime against humanity, especially when those over-drugged are children, as it is the case currently in the USA; my heart sank whilst listening to the story about Zyprexa- I was on Olanzapine for a while when I was very ill; I did not die but I put on an excessive amount of weight, which is very difficult to lose and which is a real health hazard; finally, Leonard depicted the administration of psychiatric drugs and electroshock as ‘a crime against the soul and a desecration of the spirit’, whereas he talked about psychiatry as ‘the Inquisition which seeks to suppress people’ and as ‘politics and religion masquerading as science’. A young woman told her story which featured her having suffered a brain damage as a result of over-drugging, and also her being told by psychiatrists that she needed to lower or minimise her expectations of herself and her life as she had severe ‘bipolar disorder.’; in spite of all this, the young woman went back to college and finished her studies that were disrupted as a result of her mental health crisis. Lastly, a middle-aged woman talked about how she was over-medicated and had forced ECT whilst she was involuntarily admitted to hospital; she said that her memory had been wiped out as a result of the ECT; I could detect a painful sense of loss and grief in her voice when she talked about the loss of her memory; she also said she felt all her rights were taken away when she was involuntarily admitted to hospital, which resonated deeply with my own experience of detention in a psychiatric ward as well. The Occupy the APA protest concluded with a period of silence that was kept for those who have died and suffered and are still suffering in the hands of psychiatry.